I’ve been so immersed lately with the concepts of self-image and how people can be ostracized, marginalized, and worse, because of the way they “present” to the world…the way they look. Our ideals of beauty can be tyrannical, and my work last week with young survivors of burn injuries taught me so much (and, of course, showed me incomparable beauty). An artist and organization I admire (I have a couple of friends who have been involved with them over the years), working in the same ocean of impressions I’ve been diving into, is Rick Guidotti and his Positive Exposure. 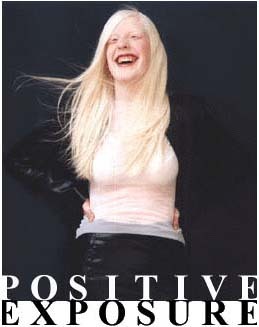 Rick was a fashion photographer in New York, capturing images of those thought to be the world’s most beautiful models…then one day he saw a stunning girl at a bus stop who had albinism. He was inspired to discover more about this and other genetic differences, and began his non-profit and his life’s new direction–to photograph people with “differences” in ways that truly expose beauty (unlike much of the literature and textbooks that present “symptoms” of “disease”). There is no room for pity in his work, and now Rick uses photography and video to explore genetic, physical, and behavioral differences. In some societies, specifically in African nations, where Rick has done intensive work, a child born with albinism is thought to be a witch, or of the devil, and might be shut away or killed…there are cultures around the world that have such shame about anything outside their expectation or perception of acceptable looks, that it can result in true tragedy. Positive Exposure does photo shoots, self-esteem workshops, education, advocacy, counseling, media, and their “Pearls Program” for kids in grades K-12, teaching them how to embrace and celebrate everyone’s difference and uniqueness. Support Positive Exposure’s truly life-altering work, and explore more about albinism at the website for NOAH (National Organization for Albinism and Hypopigmentation). This organization sounds fantastic, yet the website is simultaneously crowded visually AND devoid of content on many of the sidebar menu options. You’d think a group that started in 1998 would have a complete and fully functional website by now. For example, I was hoping to do a search for photos of kids with a common, specific genetic abnormality (Fragile X Syndrome) but there is no option for doing that. Sorry for being so negative; I know the group means well and the photos are really nice.